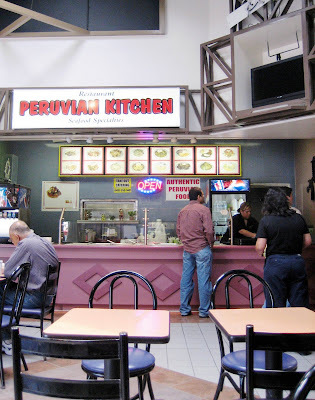 So here's what happened since we last checked in: Lima City (a Peruvian food stall in an Irvine food court I previously reviewed) is gone, replaced by Peruvian Kitchen, who moved out from its Fountain Valley digs, which is now occupied by another Peruvian restaurant called Casa Inka. I won't attempt to explain the reasoning behind this game of Peruvian restaurant musical chairs, except to say that it sounds like the plot of a bad telenovela. But whatever may have occurred behind the scenes, it's a good turn of events, at least for Irvine. At first, I didn't think so. When I saw that new owners had taken over Lima City in a bloodless coup, I shunned their offerings. I was a Lima City loyalist, entrenched in a comfortable routine of ordering nothing but their mushroom chicken from a heated trough. I ate the dish once a week. Sometimes even twice or three times. Sure, it wasn't something I'd ever seen at any other Peruvian restaurants. And yes, the dish's authenticity was dubious. 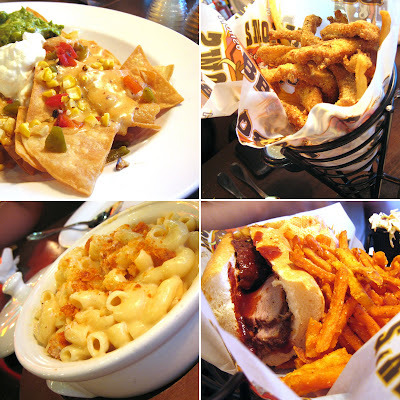 It's deliciousness, however, was undeniable. Above all, it was quick, good, and cheap -- perfect for a working schlub with only an hour to spare for lunch. Who was this interloper who drove my mushroom chicken into permanent exile? Within a few weeks, new signs were installed, revealing that it was none other than Peruvian Kitchen, the highly regarded Fountain Valley restaurant which I hadn't gotten around to trying. Why it was slumming it in a food court, I hadn't a clue. Though now I had no excuse, no choice, but to give it a chance. 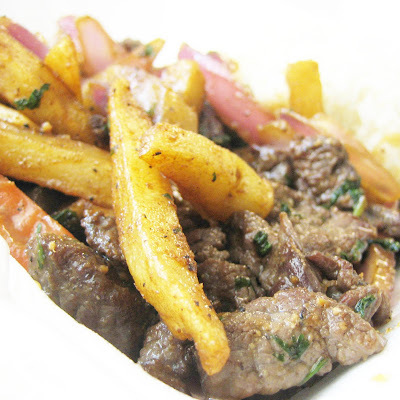 And what better than lomo saltado to test the waters. The chifa staple is the pad thai of Peruvian food; a dish that isn't exactly indigenous but still ubiquitously popular in Peru and in Peruvian restaurants stateside. The first thing I notice shortly after I ordered the saltado was the leaping flames of a stove reflected on the walls of an unseen kitchen. Someone back there was working a wok over a very high BTU burner. Since saltado is essentially a Chinese stir-fry mixed with Latin flavor, this was a good sign. 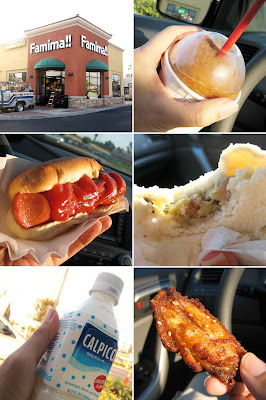 Scarcely five minutes later, my order was handed to me, already packed in Styrofoam container. I found a seat and flipped open the lid. When I did, a plume of hot steam carrying the aroma of cumin and soy sauce escaped. It smelled exactly right. 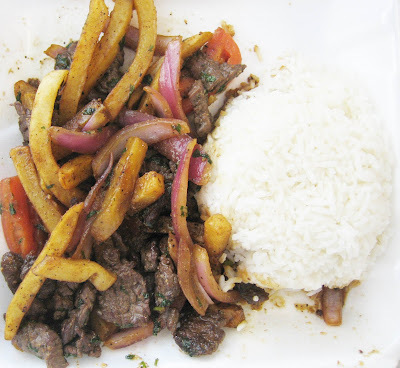 Then I took a bite and tasted the best saltado I've had since El Pollo Inka in Lawndale. The beef wasn't just tender, it melted. Everything that surrounded it -- the fries, the red onion, the tomato -- was wokked and seasoned perfectly. It was flavorful, crisp, and alive. Even the rice was spot on. Cooked with a hint of chicken broth in a similar manner as Hainan chicken rice, the starch could've functioned as a standalone dish. Though it was one of the more expensive meals I've ever had in a food court ($9.69 after tax), it marked the moment that I greeted this occupying force as liberators. Rest in peace mushroom chicken, wherever you are. First things first: if you are Vietnamese or otherwise familiar with the culinary terrain and back alleyways of Little Saigon, stop reading right now. If you do not heed this warning, I will not be responsible for the damage your spit-take will do to your computer screens. The restaurant I'm about to review is not meant for you. It's cut from the same cloth as The Slanted Door in San Francisco, and Crustacean in Beverly Hills; places that charge $8.95 for a bowl of pho without batting an eye, catering to customers who might even think it's a bargain. Need more proof? 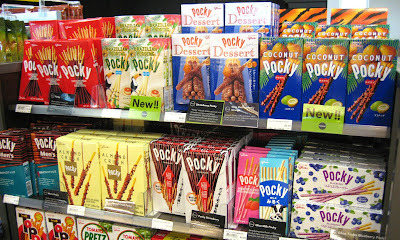 The dinnerware looks like a showcase for Mikasa and in the crowded room, my Asian face was in the minority. Perhaps my lovely dining companion said it best when she said, "no self-respecting Vietnamese would ever eat here." But unlike Crustacean, a regrettable experience that still makes my blood boil, I liked Benley, a lot. 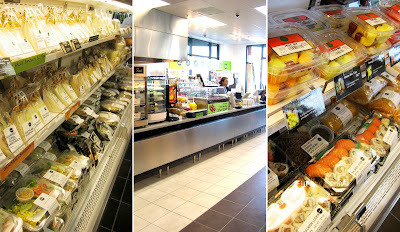 This is an eatery that shares the same sort of vibe as one of my favorites, Cafe Hiro. It's in a sparsely decorated, long, bowling alley of a room that feels as casually unpretentious as it does claustrophobic. And just like Cafe Hiro, the kitchen takes the base flavors of an Asian culture and blends it with a touch of European prep and presentation. Use the dreaded "f" word if you must. Yes, it is "fusion". But with that said, I still couldn't justify paying nine-dollars for bowl of pho. What I ordered instead was four appetizers and a curry chicken dish. 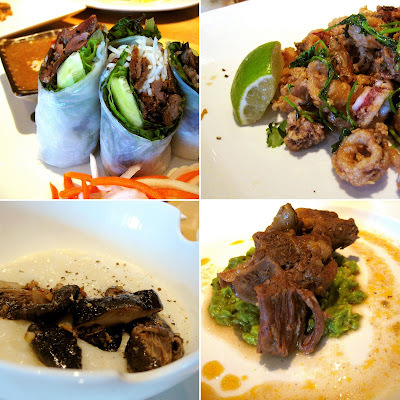 The first was the lemongrass-charred pork spring rolls ($6.95), which is goi cuon thit nuong for you Little Saigonites who are still with me. Of course, it was just the same protein you'd see on a plate of com tam, wrapped in rice paper with cucumbers and noodles, served with a traditional peanut dipping sauce. But somehow, despite the fact that it was cut on the diagonal and fashionably arranged upright like a modern art piece, it still won me over. The ribbons of pork were well-flavored like it's meant to be; the rice paper had a pleasant chewy pull; and the dipping sauce was a blubbery warm contrast to the cucumber's cool. It made me forget (at least for the few seconds it took to eat them) that I could've gotten double the amount in nem nuong rolls at Brodard for a dollar less. Battered, salted cuttlefish ($7.95) was just fried squid by another name -- and when did "cuttlefish" suddenly become a more palatable word than "calamari"? Yet, it's one of the better versions I've had lately. Coated in a bubbly batter with a noisy crunch, it's pre-drizzled with lime juice and wilted cilantro. Not surprisingly, it's refreshing to the palate and addictive as a result. 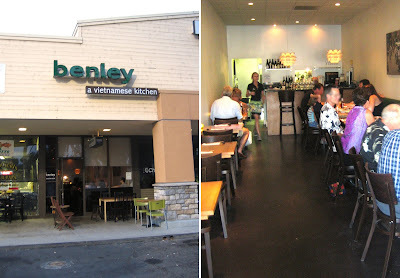 Then there's something Benley's menu calls "Vietnamese risotto"($5.95), a dish that demonstrates how well the restaurant has mastered word play with a translation both ingenious and dangerously effective. I was so seduced by it that I completely missed the Vietnamese word printed in italics beneath it. Its true identity? Chao. That's right folks. I ordered porridge. And I loved it. Obviously, the substance was nothing like risotto. Its consistency was just what you expect of congee. Plunge a spoon into it and the starch clings like oatmeal. But it's good and satisfying. Every helping was a spoonful of comfort with the taste of chicken broth, cracked black pepper and sauteed mushrooms. If the dish could wink at me and say "Gotcha!" it would've. And I would've high-fived it right back. For the next dish, care to venture a guess to what the "avocado puree" served with the braised short rib ($6.95) will remind you of? If you said "guacamole", you get a prize. So does Benley for creating it. It's simply that: a chopstick-tender hunk of beef, resting on an island of mashed avocado. And despite the fact that the protein needed a touch more salt, it worked. 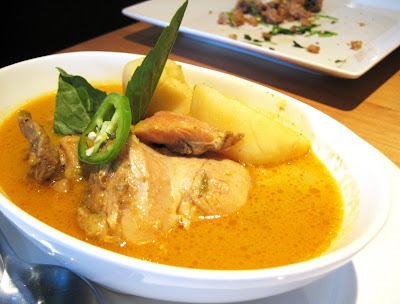 The main course of chicken curry ($10.95) involved no descriptive shenanigans or clever marketing-speak. It's nothing more than two fist-sized boulders of boneless dark meat simmered in a murky yellow broth flecked with tiny melted globules of the rendered fat. Also swimming in it was an obligatory chunk of potato. Although it was served with an inordinately small serving of rice that will get depleted before you finish the dish, the curry was light enough and perfectly suited to being sipped as soup. 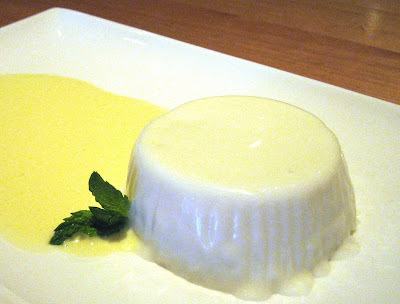 Dessert was buttermilk panna cotta ($6.95), a jiggly, tangy, mouth-filling pudding more sophisticated than Jell-O and lighter than custard. Straddling it was a puddle of sauce that tasted like the lemon meringue filling from Polly's or Marie Callender's. With it I propose that Benley revise its subtitle. Right now it reads "A Vietnamese Kitchen." To that, I would add an asterisk. A large, leafy tree stands in the middle of the room. Near the queue to the register, there are two booths made up as jail cells, complete with metal bars and wanted posters. It's corny. It's kitschy. It's the kind of interior design cribbed straight out of the Walt Disney playbook on Western theming; a cartoony, fun, Frontierland-version of the Old West, intended to disarm and put you into a playful mood conducive to eating lots of BBQ. I didn't need any more convincing. BBQ was already on my brain. 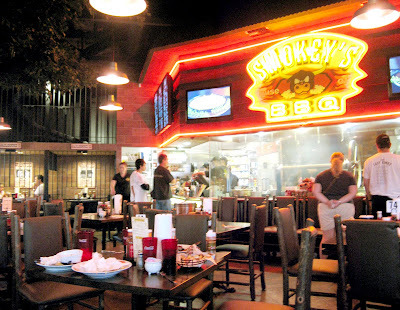 Why, after all, would I drag my friends to Dana Point to Smokey's House of BBQ if I wasn't looking forward to a night of sinking my teeth into a rack of baby backs, stripping meat from bone, licking my sauce-sullied fingers. Unfortunately, despite the open kitchen that boasted a steel-grated, platform roasting rack that can be lifted and lowered into a pit of fire; I am still waiting for my night of BBQ bliss. The chile con queso ($4.99), which duped our group of Californians into thinking we were ordering a bowl of chili with cheese, was actually chile with the "e" -- a dish any Texan would recognize as an appetizer similar to nachos. We loved it anyway. Triangles of fried tortilla -- perfectly rigid and addictively crunchy -- were piled on a plate and drizzled in a silky, spicy, cheesy sauce that bordered on Cheez Wiz and fondue. Grilled corn nibblets, diced chile, and messy dollops of sour cream and guacamole rescued it from being mistaken for movie theater nachos. Then there were the catfish fingers ($6.99); fried bite-sized pieces of fish, breaded in just enough cornmeal to protect the flesh from drying out in the hot oil. Dunked into a searing remoulade, each nugget was easier to eat than popcorn and just as fun. We would've laughed off the side of "Gourmet Mac & Cheese" ($5.99) for its oxymoronic title, but it pleased our resident mac-and-cheese connoisseur. Though, admittedly, she hasn't met a mac-and-cheese she hasn't liked. My other tablemate, who ordered the tri tip po' boy ($12.99), couldn't stop eating the hot, lightly-battered, and freshly fried sweet potato fries that came with the sandwich; and I couldn't stop stealing them. The baked beans that came as a side to my main course was sugary enough to rot your teeth, but also strewn with bits of pork. It begged to be eaten out of pie pans, around a campfire, reenacting my favorite scene from Blazing Saddles. 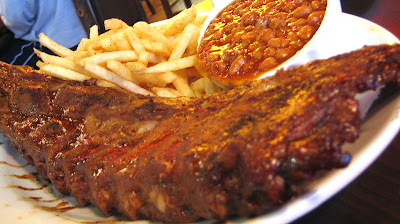 But like Will Smith's Wild Wild West, the baby back ribs ($22.99) it accompanied let me down. As with the film, expectations ran high. All signs were pointing to greatness, but ultimately, on this night, with those ribs; it lead to mediocrity. And at Smokey's, there were actual signs; big ones in bold print that all but promised meats that were slow-smoked; meats that would be fall-off-the-bone tender and flavorful. What I got for dinner was neither. Even though they were the meatiest bones I've ever seen, it took a concerted effort to work that meat off the bone. No amount of teeth tugging could coax all of it off. By the time I gave up, ragged patches of it hung on like barnacles on a ship. It's as if it wasn't cooked slow or long enough, leaving the full, lip-smacking potential of the meat's collagen untapped and the flavors muted. But what I missed most on the rack I had this night was the caramelization, where the sugars and fat combine into a tasty, brown-and-black crust. I went back to scarfing spoonfuls of their wonderful baked beans, hoping that Smokey's (which has only been open a few months) will get better soon, and chuckling again about Blazing Saddles. Now that was a good movie.